EE Wembley Cup will be transmitted via 5G. The EE Wembley Cup will be the world’s first sporting event to be broadcast over 5G using remote production, with EE using the exhibition football tournament as a showcase for next generation network broadcast technology. Last week, the operator revealed plans to launch 5G in 16 major UK cities in 2019, and aside from enhanced mobile broadband and Fixed Wireless Access (FWA) broadband believes broadcasting is the best-defined use case for 5G to date. 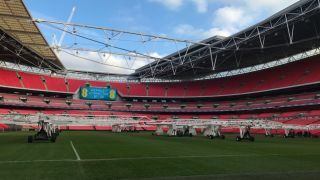 To illustrate its point, EE’s 5G network hosted a two-way broadcast between Wembley Stadium and the ExCeL centre in East London, which is currently hosting Huawei Mobile Broadband Forum (MBBF). Presenters Matt Smith and Abi Stephens were involved, with all production taking place at BT Sport’s studios at the Olympic Park in Stratford, East London. Naturally, being part of the same BT group means that BT Sport is an ideal bedfellow for EE to stage such a trial, but BT Sport has a history of using innovation to differentiate itself from the competition. This includes the use of 4K video, Dolby Atmos audio and 360-degree virtual reality (VR). “This goes back to the BT Sport concept of editorial innovation and our aim to take our customers to the heart of sport using technology,” explained BT Sport COO Jamie Hindhaugh at Wembley Stadium. 5G allows broadcasters to deploy wireless cameras around the arena and beyond, meaning that fewer camera and cameramen need to be deployed, and also offering a wider range of creative options. For example, during the 4G broadcast of an FA Cup game last season, BT Sport was able to put a camera on the team bus. Intel and the International Olympic Committee (IOC) held trials of 5G broadcasting at the PyeongChang 2018 Winter Olympics earlier this year, while golf is another sport looking to see how 5G can enhance its broadcasts. BT Sport’s head of sport Matt Stagg, who actually moved from EE earlier this year to take up the role, said that although 4G production is possible, it is less suited in areas where there are a large number of users – such as sports arenas. 5G is far more suited to broadcasting than 4G because of the enhanced capacity and because operators will be able to use network slicing to guarantee a minimum standard of speed and throughput. “We wanted to do this with 4G and looked at the possibilities, but it wasn’t viable,” added Stagg. What’s more, it will make outside broadcasts far more efficient. At present, broadcasters use on-site trucks and fibre connections to capture images and audio and for production. The ability to send all of this data to BT Sport’s studios means that production teams can be based in one place and possibly work on multiple events in a single day across different sports. “All of our teams re back at the studio so there’s consistency,” said Hindhaugh. “All the cameras are wireless, which allows us to do things differently. It also drives efficiency … it’s a dirty word … but it allows us to do more with less.